What Should Martha Stewart’s Online Dating Profile Look Like? The news went viral on Friday when Martha Stewart appeared on the Today Show, telling Matt Lauer that she almost joined Match.com, but didn’t complete her profile. 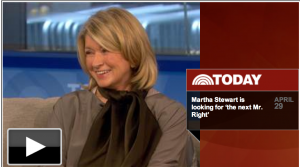 Today, Martha appeared again on Today Show to tell the world that she’s making it official. She’ll be taking the digital plunge to join the millions of singles looking for love online and is signing up for Match. Stewart, who says she loves to date, but hasn’t been in a long-term relationship for years thought she should be using her real name on her profile, but we disagree. As an online dating expert who’s been helping singles find love on the Internet since 1994, I couldn’t resist chiming in to offer Martha a little help with her dating profile. DON’T use your real name. DO create a catchy screen name. Although Stewart is 71, she says emotionally she feels 45-50. I hate to break it to you Martha, but most women brag about looking younger for their age in their profiles and it turns men off. Saying “I’m 71, but feel like I’m 50” would be wrong. Those sayings are too cliche in the online dating world. If Oprah said that “50 is the new 30,” then Martha can feel like 70 is the new 50, but she should keep that to herself. Sure Stewart wants a young active guy. Why would she sign up to change someone’s “Depends” in a few years? Stewart should list her desired age range of 65-77. If someone appears to be active in their 80s, then she can write back to him. If he doesn’t seem youthful enough to her, she can ignore his email or politely decline. Stewart should be concerned about saying she?s looking for someone young. It might send a signal that she’s a Cougar looking for a younger guy that she’d support financially. Instead, I believe Stewart should describe the activities that she likes to do and what she’d like to share with her date. Men would then get the signal that no couch potatoes should apply. Stewart should post about five photos, not an entire album. Her primary shot should be a close up on a good hair day looking happy, and she should add a few photos in her garden, outdoors, and doing activities that she enjoys. She should steer away from posting photos of her extravagant homes as it would be too intimidating to a man. Stewart completed the section on what she was looking for, describing her ideal date as ‘youngish’ and ‘outdoorsish,’ really smart, and successful. A Stewart’s written over 70 books, her editor would slash those words that don’t exist in the dictionary. Instead, I think she should say she’s looking for an active guy who likes the outdoors to hike and spend time in the garden with. Perhaps she’ll end up kissing in the tomato patch. Other celebrities who have joined online dating sites include Sinead O’Connor, Joan Rivers, and even recently Millionaire Matchmaker Patti Stanger got engaged to her boyfriend who she met on PlentyofFish. If Martha Stewart doesn’t find love on Match, she can hop over to Our Time and Senior People Meet, the 50+ online dating site, which is also owned by IAC who owns Match and OkCupid. Hopefully for Stewart, her new book, Living the Good Long Life, will include finding someone online to grow into the digital sunset with. What do you think Martha Stewart’s online dating profile should look like? Do you think she can find love online? Julie Spira is a leading online dating expert and founder of CyberDatingExpert.com. She creates irresistible profiles for singles on the dating scene. For more online dating advice sign up for the free Weekly Flirt and follow @JulieSpira on Twitter.